I recently returned to South Africa from a trip to the USA after a long hiatus as an expat. Upon reentry I was hit with extreme culture shock along with strict TSA regulations and scenes straight out of an episode of the television show Homeland, complete with a full body pat down for wanting to bring my daughters apple juice box onto the airplane. Other shocks: the extremely large portion sizes at restaurants where a simple salad could easily feed a family of 4, the even larger people eating the extremely large portion sizes and encountering consumerist culture head on. In the USA I found myself in a bizarre and complex ecosystem running on overdrive, beating to an addicting pulse of material accumulation. I too got caught up in the whirlwind of “more” and feeling that I needed to stockpile I found myself waiting with the other 50+ Target shoppers on a random Saturday night in Florida at 11PM in line to check out. By the end of my 2-week visit to Florida, I could hardly close my suitcase. It struck me as odd that at all times of the day and late into the night Floridians appeared to be shopping. The parking lots were full of cars and in order to find an open spot you had to stalk a shopper leaving a store who couldn’t see above their overflowing shopping cart. I wondered what everyone was buying all of the time and was shocked at how our quick trips to the grocery store resulted in a serious case of “eyes bigger than tummy”. I missed the smaller food markets of South Africa where although there are fewer options on breakfast cereals, it didn’t take me three years to comb through the six isles of cereal boxes. Then there were the red, white and blue sale items you just couldn’t resist, the bulk purchases on deals that were just too good to pass up and all the zillions of gadgets designed to make you think that “life could be easier if I just had X”. Life is a lot simpler, I thought, when less is more. I was ready to go home. South Africa is a troubling place where the 99% is reality- this is the land of the extreme haves and the extreme have nots. Where the haves are hassled every day when they stop in their BMW’s for spare change from the mangled beggars swarming on the streets. It is my everyday dose of reality that I am part of the 1% here (even though I don’t own a BMW). The haves drive in fancy cars, live behind high walls and electric fences, go to private schools, pay for the protection of private security ex-militia ground patrol teams and many are extremely successful in business. The life of the 1% (or .00001%) in South Africa is designed to keep a very, very safe distance from the have nots (who will kill you for your fancy BMW). It is definitely not the simple life. It is the extreme version of some paranoid and sometimes psychotic reality T.V show. South African society is obviously not, by any means, sustainable from a socioeconomic perspective. Many believe that the South African economy is actually a “ticking time bomb” as unemployment continues to soar, leadership seems incapable of creating alternative solutions and the future for youth looks bleak. A life of crime is often your only option if you want to survive. In this paradigm, the haves will continue to pay (sometimes with their lives and all the time from living with the fear of being killed) for having what everyone else wants. It has been interesting to reflect on my encounter with America back in South Africa, especially in the wake of the recent school shootings. That this is a troubling trend is a sorry understatement. 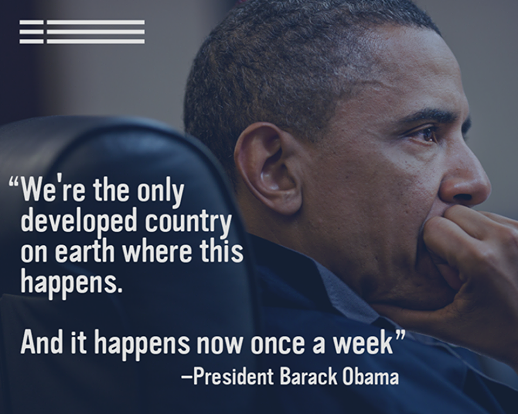 The new reality of the USA goes beyond gun control, stricter PG-13 ratings and video games gone crazy. It has been hard to make sense of it all from South Africa, but then I realised that the new reality of the USA is a mystery to us all. America is the land where everything can be bought or acquired through some means on instant gratification. In this reality, what still remains out of reach for today’s tormented middle-class, suburban American youth? What do they not have? What is missing from their lives? What is American society not asking, or not wanting to see? Perhaps that you cannot buy hugs or love or attention from your parents? Perhaps your parents are too caught up with the curse of more to just be in the present moment? Or perhaps youth of today do not even know what they want or what they need and this emptiness is the source of their greatest pain. There have been 74 school shootings since Sandy Hook. America is under siege from the enemy within: gun-crazed out of touch and diabolical children- it is the real Zombie apocalypse. We can no longer explain away these child killers as misdiagnosed, overmedicated or mismanaged Aspergers cases. If America is unable to scientifically explain the root causes of these horrific school killings, there must be another attempt to go deeper as a society to uncover what lies in the shadows of this trend. Since returning to South Africa I have been grateful for the slower pace of life, the harsh reality checks, the order even in chaos- and especially for the non-existence of school shootings. When I unpacked my suitcase I realised it was all just full of empty stuff. That the real “stuff” of life is inside of me. That participating in the consumerist culture of America actually depleted me instead of filling me up. I realised that being grateful for what is on the inside of me is really where it all begins. What can South Africa, a society of have nots learn from America, a society of haves? Perhaps the challenge for both societies, America and South Africa, is to create a new framework for fulfilment, from an internal rather than external source. This entry was tagged America, Consumerism, Sandyhook, School shootings, South Africa, youth. Bookmark the permalink. Though-provoking post, Mimi. I feel the same way every time I go to the US – almost like I’m literally being hit in the face with a consumerist punch.